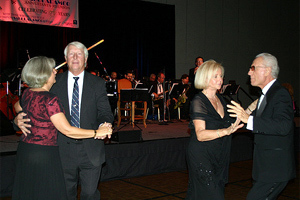 On Wednesday, October 1st, the final night of the 2008 Annuitant Reunion, Jabal Las Vegas, 1,000+ attendees gathered for the traditional Gala Festival at Paris Hotel and Casino. Pre-dinner activities once again included a cocktail hour with a formal photo opportunity to help commemorate this year’s reunion with your closest Aramcon friends. As Annuitants found their seats and posed for informal pictures with friends in the Rivoli Ballroom, vocalist Rob Zappulla and his big band entertained the crowd with a Tribute to Frank Sinatra, performing songs like “Luck Be a Lady” and “New York, New York.” Many Aramcons took to the dance floor to show off their footwork during the pre-dinner entertainment. 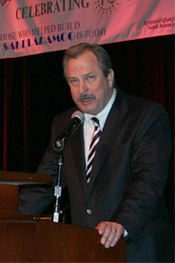 “The 1933 concession agreement between the government of Saudi Arabia and Standard Oil Company of California led to the discovery of one of the world’s greatest energy reserves,” Mr. Macbeth said, reminding all that it was the determination of those individuals seventy-five years ago, combined with the stalwart fortitude of many others, who helped build Saudi Aramco into the company that it is today. Mr. Macbeth continued by giving a brief overview of some of the current projects and goals for Saudi Aramco today, including exploring new frontiers for energy, like the Red Sea, and the ongoing efforts to maintain Saudi Aramco’s status as a “reliable, environmentally-responsible company.” He also reminded retirees that their job is never really done, as they continue to display a positive reflection of the company and Saudi Arabia, and support the company in future employee recruitment efforts. Vicci Turner giving away a prize. After some more dancing, Vicci Turner of Aramco ExPats.com held a raffle drawing for some Aramco ExPats merchandise, including the grand-prize of a gold Aramco ExPats necklace. Following the raffle, winners in the Golf and Tennis Tournaments were also acknowledged by Kay Miller and Eva Farnsworth, respectively. Catarina Beresky of the Saudi Aramco Community Heritage Gallery then gave away some gifts collected for the reunion, including special 75th Anniversary flags. The last presentation of the evening was arranged by reunion hostess Karen Fallon with special gifts for the seven “Old Timers” in attendance. As they received their gift and took a bow, they were honored with a standing ovation from the crowd. Finally, Karen Fallon thanked the many volunteers for their help in running this year’s reunion, and in turn, the audience toasted Karen and her husband Al for their work in organizing and hosting the reunion. With that, Aramcons continued to dance and celebrate the night away, looking forward to the next reunion in 2010 with just as much enthusiasm. 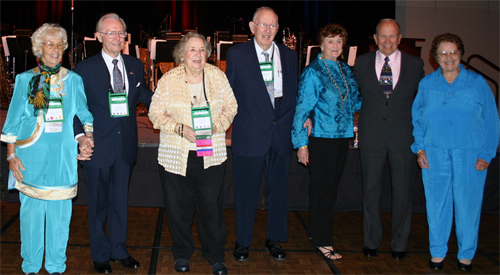 "Old Timers" honored at Jabal Las Vegas 2008 Gala Dinner.